KISS - Keep It Simple Silly - as my Dad would tell me. So this is that, a KISS card with Sparkle!! 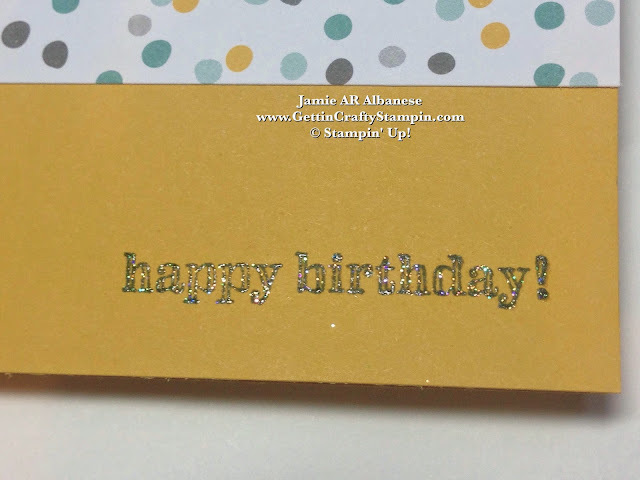 Creating a fun and simple card is a great time-save while highlighting a special item on the card. Having recently watched a special on The Smother's Brothers... I knew that I had to create a Yo-Yo card!! So enjoy this KISS Yo-Yo card with some sparkle... I hope it sends you 'Around the World' (a yo-yo trick - lol). Add dashes of sparkle to this clean card with a few methods.. SNAIL the Moonlight Designer Series Paper to the Hello Honey card stock. Apply the small and medium adhesive backed Rhinestone Jewels in random places to tie into the fun polka dot pattern. 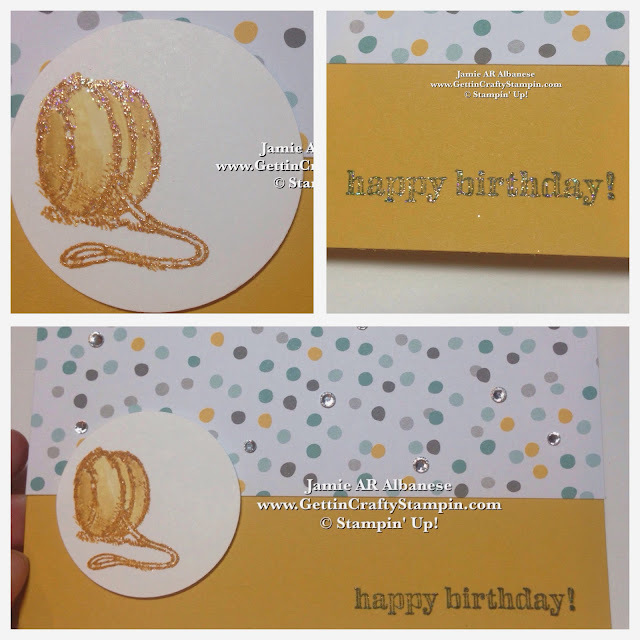 Here prepare the surface of the Whisper White card stock by rubbing the Embossing Buddy across the surface. Hand-Stamp the image of the YoYo from the Boys will be Boys stamp set in the Hello Honey ink pad. QUICKLY Cover with the Iridescent Ice embossing powder for a clear, raised and sparkling addition. Make sure to hold the Heat Tool at a 45* angle and heat one area until it raises, becoming shiny and sparkly. Move it slowly as each area heats and sets. The lines will now sparkle and be raised and slightly darker. Squeeze the Hello Honey ink pad into the lid and use this excess palate of color with the Blender Pens. Here you have real control to color and shadow but not a 'watercolor' look. 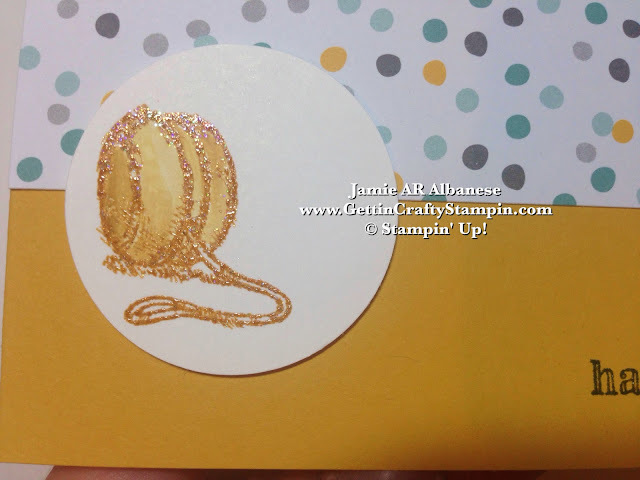 Punch the image out with the 1-3/4" Circle Punch to coordinate with the pretty Moonlight paper. The off-center punch also lends toward the random polka-dot-ness. 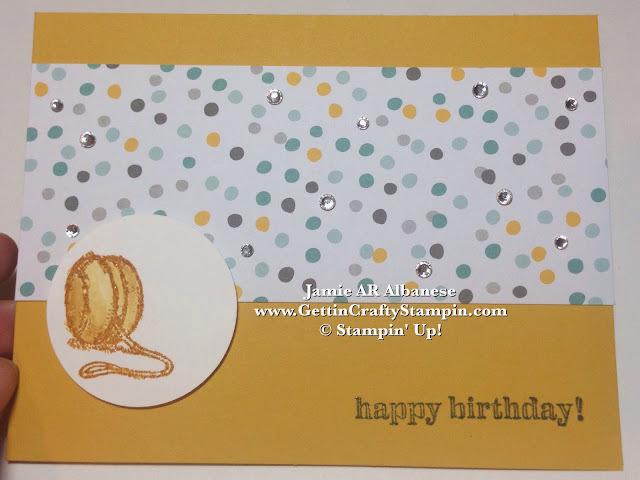 Use the Stampin' Dimensional Adhesive to create dimension and let this card raise above the rest! Here, this 'Happy Birthday' from the Boys will be Boys stamp set looks sharp in the new Lost-Lagoon ink pad. QUICKLY Apply the Iridescent Ice and Emboss with the Heat Tool for a dash of additional sparkle!! Photographing sparkle is pretty challenging - lol... I hope that you get the impression that it's sparkly but not 'in your face'. It isn't 'in your face' but rather a cool, classic KISS card that has a subtle but impactful sparkle! My Daddy would have been proud (he often told me to KISS and loved The Smother's Brothers, lol). This card, even with sparkle, is great for the young and old, male and female. There is something lovely about highlighting an image on a clean card. This hand-stamped simple but fun card is a fun way deliver some smile and memories (add a Yo-Yo gift delight the young and young at heart).